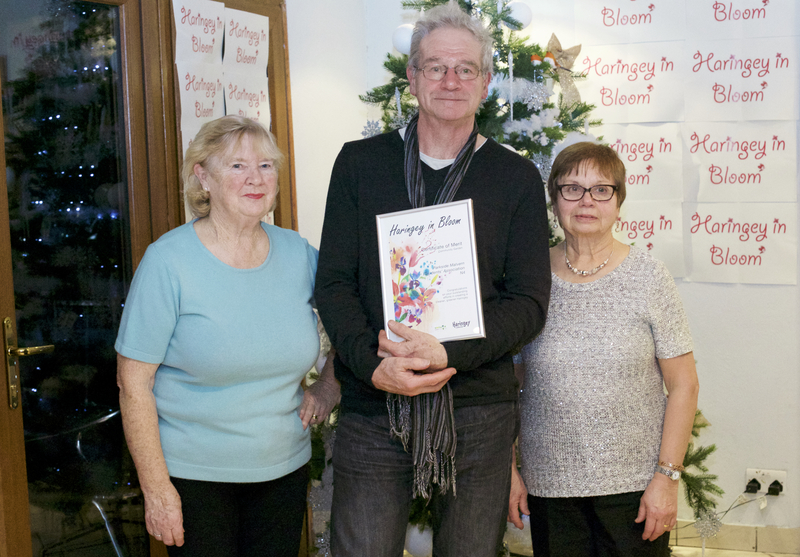 Community Gardeners Dorothy Rose, Noreen Johnstone and John Miles receive a Haringey in Bloom Certificate of Merit on behalf of PMRA at Sunshine Garden Centre on 19th December, 2016 as our community gardening group notches up 10 years. The certificate was awarded to the Lavender Garden, created by PMRA on neglected ground at the junction of Hornsey Park Road and Clarendon Road in 2010. The garden not only enhances the area and provides a much needed public garden in which to rest, the visible participation of residents in its upkeep is a beacon of ‘community’ and appreciated by many who know little of the area. It is also a symbol of how, when the council and community work together, lasting change for the better is achievable at very little cost. Its plaque is a message that the garden, and the nature that has found a home in it, are a symbol of our ‘better nature’, bringing us together at any moment and in every season. Its plants were chosen to evoke more Mediterranean climes, with lavender, olive, fig and cypress, reflecting the makeup of our community over the past 60 years as well as the sunny and dry character of the site. Many of the plants have been given by neighbours. The community gardening group meets on the first Saturday of each month with the long term aim of turning every available, precious corner of public space into a part of the ‘community garden’, each within a few steps of the other. 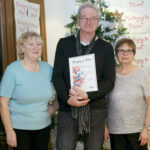 We are frequently given unwanted plants, grow our own, find homes for the self-sown, use woodchip from tree management in the area and compost from the community ‘giveaway’, and don’t use pesticides. At our October gardening, we celebrated the memory of Paul Walker, a founding member of the group and friend of our community who helped make the garden but sadly lost his fight with cancer. From the youngest to the oldest, from the most recently arrived to our oldest residents, from the casual visitor to someone looking for a place to rest or a place that is always open, this small garden lifts hearts and exists only through kind deeds. Find out more about our Community Gardening by clicking the Community Gardening tab.